Whether you’re a kid or simply a kid at heart, Ultimate California Pizza Game Zone is the perfect place to combine food, games, prizes, and fun! Our tasty menu will satisfy even the pickiest eaters while still allowing the bolder eaters to branch out and try something new. Our arcade games will have the adults feeling nostalgic and will keep the kids entertained for hours. 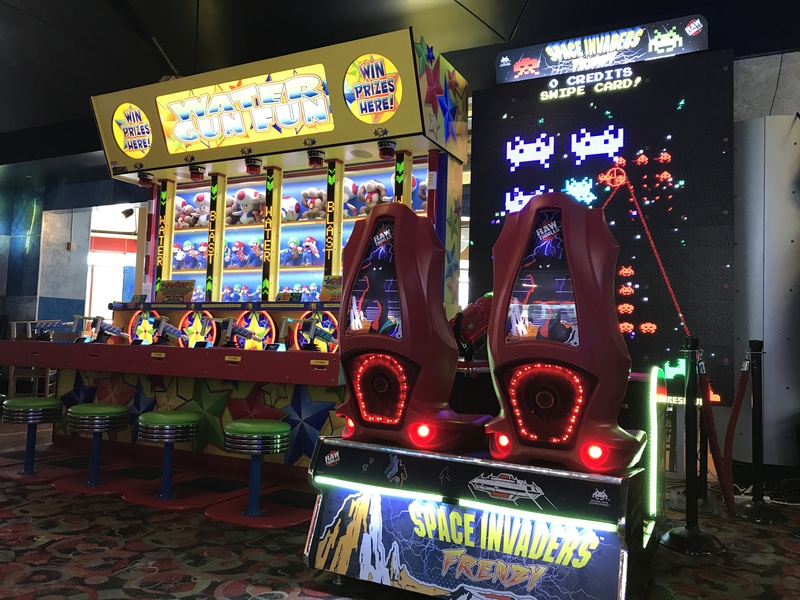 From the first bite of pizza to claiming your prize at the prize center, the entire family are sure to have non-stop entertainment at UCP Game Zone! Before you can show off your skills in the arcade, make sure to grab a few appetizers to kick off your day. Grab a plate of our oven baked wings smothered in the sauce of your choice. Or, kick off your meal with one of our many tasty bread options — we offer Garlic Bread, Jack Bread, Cheesy Stuffed Breadsticks, and Tijuana Flatbread. Or you can keep things simple and munch on some chips and salsa while you wait for your pizza! Have you ever met someone who doesn’t like pizza? We haven’t either! Whether you like to keep it simple with cheese and pepperoni or if you’re one who loves to pile on the loads of toppings – the options are endless.Get adventurous and build your own pizza with our wide variety of fresh toppings, made from scratch crust, variety of cheeses, and homemade sauce options. Plus we offer gluten-free, vegan and vegetarian options – so we’ve got everyone in the group covered! We also have a list of specialty pizzas to order from. If you’re looking for something with a little bit of everything, you will absolutely love our Big Kahuna! This monster of a pie lives up to its name and is not for those with a weak appetite. This mouthwatering pizza is covered in pepperoni, smoked ham, ground beef, italian sausage, pork sausage, sautéed mushrooms, green peppers, onions, black olives, roma tomatoes, mozzarella, parmesan & smoked gouda. When we said there’s a little bit of everything on this – we weren’t messing around! Keep things cheesy with our Ultimate Cheese Pizza. Sometimes mozzarella just isn’t enough on it’s own, which is why this pizza is smothered in Ultimate Red Sauce, mozzarella, cheddar, Swiss, parmesan, Monterey Jack, and provolone. If you love meatball subs, our Ultimate Meatball pizza will steal your heart. This tasty pizza is covered in Ultimate Red Sauce, loaded with meatballs, topped with provolone and mozzarella, and then finished with oregano and shredded parmesan. The options are endless when it comes to pizza at UCP Game Zone! No matter what you’re craving, you’ll be able to find the perfect pizza to help you fuel up before hitting the arcade. Pay tribute to the classics with a game of skeeball or dueling hoops. Or go hop in one of our bumper cars and bounce off your competition in the Spin Zone. Take a trip back in time and avoid dinosaurs in our Jurassic Park game or battle zombies in The Walking Dead. Another classic that all ages will love is Space Invaders! Launch your attack in between slices of pizza and go for the high score. Two of our must play games include our two-lane bowling alley perfect a friendly game against a family member or friend and our Lazer Frenzy! If you wanna make things interesting, face off in our water gun race and the loser buys pizza. Once you’ve had your fill of pizza and games, make sure to stop by our Trophy Prize Center before you head out. There’s no need to keep up with tickets or coins. Your game card tracks your points for you and you can load up on prizes when you’re done. We have all the top prizes and hottest toys from pool floats, Nintendo products, stuffed animals, basketballs, and more! From tasty appetizers and pizzas, exciting games, to a fully stocked prize center – Ultimate California Pizza Game Zone in Myrtle Beach truly is the perfect place to have fun, eat, win, and play! Time to Break the Cabin Fever!